12 volt portable air compressor. 12 volt cooling rotary fan. (Only a suggested list - lots more compatible options) . The portable and rechargeable multi-function power station is power-on-tap miles from anywhere. This unit charges while driving, with gobs of power at the ready when you need it. 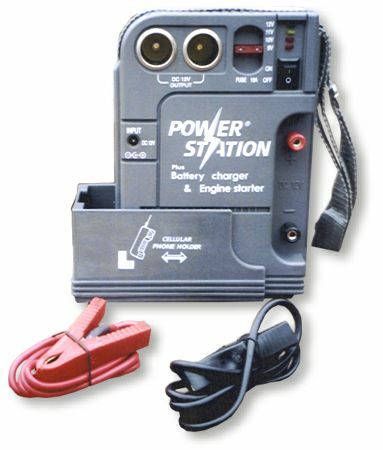 Portable, cordless power source anywhere. Dimensions - 83/4" H x 6" L x 31/2" W.
Output - 12 volt, 10 amp, 120 watt. AC charging - 8 hours (pre-expedition). DC charging - 3 hours (while driving). .